Changes need to be made so that vulnerable people get what they need at the time when they need it — and as a result are able to have the best possible life outcome, stay in the workforce, and keep earning their own living. In addition, the video also explains WHY and HOW some people have unexpectedly poor outcomes of conditions that do not normally cause significant work disruption and job loss. Unless you’re in my line of work, it is hard to understand why things turn out badly in some cases and not in others — especially if they looked exactly the same at the beginning. The video is loosely based on a one-page Work Disability Prevention Manifesto I wrote. I put a draft of it on this blog last spring and got many useful comments. After many revision cycles, it is now as succinct and compelling as I know how to make it. ODEP had no hand in the Manifesto; it’s my independent work. I’m glad I can now share these two items with you because the WORLD needs to know more about these issues—and most PEOPLE in the world have a very short attention span and no interest in the topic to begin with. I hope you will pass this stuff along to the people whose thinking you want to change or whose buy in you need. Then maybe THEY will pass it along to others as well. Social norms ONLY SHIFT when people share powerful mind-opening ideas with one another. Lastly, let’s all stop speaking ABOUT these problems. It is time for us all to start speaking FOR action and FOR changes. Millions of American workers lose their jobs each year due to injury, illness or a change in a chronic condition. Preserving people’s ability to function and participate fully in everyday human affairs, including work, is a valuable health care outcome, second only to preserving life, limb, and essential bodily functions. A new medical problem that simultaneously threatens one’s ability to earn a living creates a life crisis that must be addressed rapidly and wisely. Most people are unprepared for this double-headed predicament. It can overwhelm their coping abilities. When medical conditions occur or worsen, especially common ones, most people are able to stay at or return to work without difficulty. However, many prolonged work disability cases covered by private- and public-sector benefits programs began as very common health problems (for example, musculoskeletal pain, depression, and anxiety) but had unexpectedly poor outcomes including job loss. Loss of livelihood due to medical problems is a poor health outcome. Worklessness is harmful to people’s health, as well as to their family, social, and economic well-being. Why do such poor outcomes occur? Medical conditions by themselves rarely require prolonged work absence, but it can look that way. Both treatment and time off work are sometimes considered benefits to be maximized, rather than tools to be used judiciously. Professionals typically involved in these situations (health care providers, employers, and benefits administrators) do not feel responsible for avoiding job loss. Unexpectedly poor outcomes are frequently due to a mix of medical and nonmedical factors. Diagnosed conditions are inappropriately treated; others (especially psychiatric conditions) are unacknowledged and untreated. The employer, medical office, and insurance company (if there is one) operate in isolation, with little incentive to collaborate. Without the support of a team focused on helping them get their lives back on track, people can get lost in the health care and benefits systems. With every passing day away from work, the odds worsen that they will ever return. After a while, they start to redefine themselves as too sick or disabled to work. When people lose their jobs and do not find new ones, they barely get by on disability benefits and are vulnerable to other detrimental effects. Good scientific evidence exists about how unexpectedly poor outcomes are created, how to avoid them, and how health care and other services can protect jobs. Health-related work disruption should be viewed as a life emergency. Productive activity should be a part of treatment regimens. 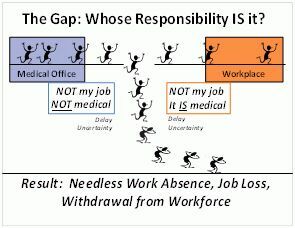 When work disruption begins, it can be both effective and cost-beneficial to have a coordinator help the individual, treating physician, and employer communicate and focus everyone’s attention on maximizing recovery, restoring function, accommodating irreversible losses, and making plans for how the individual can keep working, return to work, or quickly find a more appropriate job. We must urgently establish accountability for work disability and job loss in our workforce, health care, and disability benefits systems and build nationwide capacity to consistently deliver services—just in time, when needed—that help people stay at work or return to work. This entry was posted in Articles, Publications, Research, Musings, People, Organizations & Websites, Policy Issues and tagged accountability, acquired disability, disability, evidence-based medicine, Federal, functional restoratoin, intervention, job loss, leadership, medical care, outcome measures, over-treatment, SSDI, system, time, value of healthcare, work disability, worklessness on September 9, 2016 by Jennifer Christian. Almost immediately, it became obvious to me that in order to make a solid contribution to the on-going public dialogue about health outcomes, the paper would have to explore the meaty issues of explicit expectations, accountability, metrics, credible data, rewards for best practices, and incentives for both participation and performance. Soon after that, the absurdity of discussing expectations and accountability for the healthcare system alone became obvious —because organizations in other sectors of society play a role in the SAW/RTW process, each of which has enough discretionary power to support or thwart it. Thus, over time, the purpose of the paper shifted to answering this question: What has to happen in order to engage the professionals at the front-line — the ones who work directly with affected individuals and make discretionary decisions about how much effort to make and for what purpose — so they start making a real effort to help people stay employed? Who are those front-line professionals? (1) Healthcare professionals. Most of us view our purpose as making accurate diagnoses and providing appropriate treatment. We are generally not trained to assess work capacity and prevent work disability. Yet our opinions about work have considerable weight under law, regulations, insurance policies and traditional business practices. We generally don’t spend much time and energy thinking about issues outside the exam room. (2) Workplace supervisors or HR professionals. Their focus is the business of the organization, producing its goods or delivering its services,as well as abiding by company policies and applicable laws. They can decide how much effort to make to help the employee stay at work and keep their job. With rare exceptions, they are neither aware of the preventable nature of most work disability, nor are they trained how to negotiate and arrange stay at work or return to work plans, identify alternative temporary tasks or reasonable accommodations. And they are not incentivized to do so. (3) Claims/benefits administrators. Their focus is administering the benefit programs correctly, establishing eligibility, compensability, meeting deadlines, making payments, and other requirements. In between these duties, they decide how much effort to make to help the beneficiary/claimant. Like the workplace professionals, with only rare exceptions, they are neither aware of the preventable nature of most work disability, nor are they trained how to negotiate and arrange stay at work or return to work plans, identify alternative temporary tasks or reasonable accommodations. And they are not incentivized to do so. As I thought about these players and those who influence their behavior, the biggest realization dawned more slowly: job loss is a potentially devastating secondary consequence of a health-related employment disruption or a failed SAW/RTW process — because it often leads to permanent withdrawal from the workforce. In fact it is the third worst outcome of a health condition, the other two being death and loss of limb or core functions like sight and hearing. Yet we have not seen it that way. Unlike death and serious injury, job loss is generally not noticed. It’s actually a hidden outcome. The frequency with which it occurs can only be estimated indirectly — because it is untracked and thus invisible. When someone loses their job due to long-lasting illness or injury, they often end up leaving leave the workforce permanently, becoming dependent on public benefits programs like SSDI. Some years ago, a senior Social Security Administration official commented to me that SSDI is the largest insurance fund IN THE WORLD and yet it has no risk management program, no loss prevention program. Private sector insurance companies view these as core functions of their organizations. They know they must identify and take steps to reduce risks and mitigate losses in order to meet their responsibilities and stay solvent. In my view, government should be likewise obligated to take steps to protect SSDI (and the taxpayers who fund it) from the economic consequences of the dysfunctions, inadequacies and gaps in the upstream social structures and programs — because their failures end up on public benefit programs. (3) establishing consequences of some sort when involved organizations are non-responsive (negative incentives such as financial penalties, loss of privileges, or public exposure) or do take appropriate action (positive incentives such as credits, privileges, or favorable publicity). This combination of outcomes visibility and accountability should then start to shift how parties in the private marketplace choose vendors and suppliers. How will things look different when there IS real accountability for job loss? Implementing the broad range of actions recommended in the Establishing Accountability report will require a significant long-term effort because of their comprehensive, complex, and varied nature. Taken as a whole, these actions have the potential to create truly transformational change. Success will mean that more workers living with adult-onset chronic conditions and impairments (acquired disabilities) will be able to stay fully and productively engaged in their own personal, family, and community life; protect their household’s standard of living; remain economically self-sufficient contributors to their local area economy; and avoid dependency on government programs—which will in turn protect their future health and well-being and improve their children’s future prospects. At the national level, success has the potential to stem the tide of declining labor force participation, lighten taxpayer burdens, and bolster the nation’s social fabric and the vitality of the economy. All in all, the initiatives proposed make good use of limited government resources. The ultimate success of the initiative will hinge on the ability of Federal policy leaders and supporters to create and sustain real multi-stakeholder buy-in and enthusiasm for achieving the future vision described in the paper. A good next step is for the federal and state governments to decide whether and where to start. It will take time and effort to achieve consensus among key stakeholders that this kind of initiative is necessary, timely, and deserves priority for person-power and funding. Once that preliminary groundwork is laid, more detailed planning work can get underway. Whoever you are, I hope you read the Establishing Accountability paper and agree that change and action is needed. If my suggested recommendations spur you on to creative thinking, you do NOT need to wait for the government to act. You can start factoring these issues into your decisions about who to collaborate with now. This entry was posted in Articles, Publications, Research, Policy Issues, Tools, Techniques, Methods & Money and tagged accountability, acquired disability, disability, Federal, leadership, outcome measures, participation in life, system, work, work disability, worklessness on May 18, 2016 by Jennifer Christian. I was in the audience for a presentation on “outcomes based networks” in workers’ compensation while at the SIIA conference this week (Self-Insurance Institute of America) in Washington DC. The two presenters were from Sedgwick (which I believe is now by far the largest workers’ comp claims administrator [claims payer] in the country — servicing mostly self-insured employers) and from Multi-Plan (a huge PPO). The bottom line is that Sedgwick is now putting INDIVIDUAL treating physicians into ranks, from 5 stars (most preferred) all the way down to 1 star (least preferred) . HOWEVER, many physicians cannot be ranked because the “n” (number of cases for which the payers have data) is too small to analyze with any statistical confidence at all. The star ratings are NOT generally shared with the physicians — but I bet doctors who know the rankings exist can ask pointed questions about where they stand. • Sedgwick’s clients, claims adjusters, and case managers who are making referrals / recommending physicians to care for work-related injuries now have access to a user-friendly website that automatically lists doctors within certain geographies IN ORDER OF STAR RANKING (though the ranking itself is not displayed). Reality check: Some locations simply don’t HAVE any super-top-ranked providers. • Employers who are able to get most or all of their employees to 4 or 5 star doctors have DRAMATICALLY BETTER RESULTS in terms of medical/functional outcomes, disability duration and cost, including higher patient satisfaction/lower litigation rates. These employers are seeing roughly 15-20% improvement in the parameters of interest. I heard later that these are mostly California results. • The highly ranked doctors are happy to get the referrals and have NOT been asking to be compensated better when it has been confirmed that they are the best. The highly ranked doctors also tend to be the ones who do a lot of work comp — so they are attuned to the critical issues that need to be managed. Personally, I think those who DO deliver the best results SHOULD thrive and prosper as a result — not just get more patient volume. MANY doctors already feel maxed out! • How OFTEN the employers/adjusters/case managers are ACTUALLY choosing docs based on rankings. • What FRACTION of all doctors in any given geography they actually are ABLE to rank. (In other words, how many cases have Sedgwick’s employer clients actually been SENDING to each doctor.). I wouldn’t be at all surprised if it’s less than 25% of the doctors. I suspect the unranked doctors’ names are NOT presented first. • How many cases the doctor has to have treated before ranking them makes sense or is fair. Very few payers are going to have the volume of information available that Sedgwick and Multi-Plan do. Buyer beware: TPAs and networks that want to keep up with the Joneses may CLAIM to have ranked providers — but it takes a large number of cases AND considerable statistical sophistication to do this ranking stuff accurately and fairly. One catastrophic injury could make even a great physician look bad without appropriate adjustment. The speakers both acknowledged that getting accurate data and analyzing it in a fair manner has been a big challenge, and that their capabilities for doing so have improved rapidly over the last 5 years. This IS the wave of the future. Physicians who discover they are low ranked should find out why — and do their level best not to be defensive, but rather learn and improve from the experience. Buyers of /payers for services absolutely do have the right — if not the duty — to select suppliers based on the best information at hand about who will meet their legitimate needs. And physicians are suppliers in their eyes. Sedgwick got started building their Outcomes Based Networks after participating in a Cornerstone Conversation co-hosted by the American College of Occupational & Environmental Medicine (ACOEM) and the International Association of Industrial Accident Boards & Commissions (IAIABC). This was a four-way conversation among a small group of key stakeholders: ACOEM leaders, large payers, large employers, and state regulators on what needs to happen in order to improve access to high quality healthcare and improve outcomes for injured workers, and to reduce unnecessary costs for employers and payers. A joint project undertaken by ACOEM and IAIABC as a result of that meeting was the production of a Guide to High Value Physician Services in Workers’ Compensation. You may find the observations and suggestions made in this succinct document helpful — whether you are a chooser, a recommender, a payer or a physician-supplier of medical care services. This entry was posted in Events, Innovations, New Things, Policy Issues, Tools, Techniques, Methods & Money and tagged accountability, evidence-based medicine, medical care, networks, outcome measures, physicians, value of healthcare, Workers' Comp on October 22, 2015 by Jennifer Christian. — Communicate with all parties to expedite both medical care and the return to work process, including resolving non-medical obstacles to recovery and return to work, making temporary adjustments or arranging reasonable accommodation when appropriate. — Keep their jobs or promptly find new ones if that is necessary. In the USA today, a large and growing fraction of Social Security Disability Insurance (SSDI) awards are being made to people deemed totally unable to work due to conditions that are among the most common health problems in America and the world, but which only rarely cause permanent withdrawal from the workforce. Low back pain and other chronic musculoskeletal conditions (MSK), and common mood disorders (CMD) —particularly depression and anxiety—are the most prominent conditions in this category. Near-immediate assistance from a community-focused Health & Work Service will allow people with these kinds of common conditions to avoid the kind of adverse secondary consequences they too often experience today. Those consequences are usually not obvious until months or years later, after unfortunate things have happened. The unlucky ones have received sub-optimal health care, been left with under-treated or iatrogenic impairment, become dependent on opioids, found themselves socially isolated, lost their jobs, withdrawn from the workforce, lost economic independence, and ended up on long-term disability benefits programs or SSDI in order to survive. Anticipatory programs that ensure the right things happen from the start and include early identification of those needing extra support are the simplest and most effective way to prevent later adverse secondary consequences of these conditions. (f) — take a problem-solving approach in collaboration with affected individuals, their treating physicians, employers, and payers. Of course, developing the HWS will first require a commitment to funding, either by the government or by a foundation that is committed to system change. Once that has been obtained, the initiative will unfold in a series of steps including design, prototyping, development, and field-testing in different geographies, followed by a large randomized controlled trial. After that, the HWS can gradually roll out across large geographic areas. What does this mean for you? First, if you like the idea of working people getting the kind of support they need and deserve — and when it is most likely to make a difference, please support this idea in whatever way you can. Why not call or email your Congressman? Second, if you are a professional with the expertise and passion required to help people get “right back on the horse” — and are now stymied and frustrated by the current system’s inadequacies / dysfunctions, you have probably realized that the HWS service might create a lot of fulfilling and satisfying jobs for specialists like you. If so…. that’s another reason to call or email your Congressman! This entry was posted in Articles, Publications, Research, Events, Innovations, New Things, Policy Issues, Tools, Techniques, Methods & Money, Uncategorized and tagged acquired disability, chronic pain, disability, Federal, functional restoratoin, job loss, leadership, outcome measures, self-care, Social Security Administration, SSDI, system, US Congress, work disability on October 10, 2015 by Jennifer Christian. Who should be accountable for NEEDLESS job loss due to medical conditions? Who do you think should be held accountable when workers needlessly lose their jobs because a newly-acquired or changed health condition or disability? Right now, none of the professional participants who play front-line roles in the stay-at-work/return-to-work process feels a responsibility to prevent unnecessary job loss. Doctors, employers, insurance companies, lawyers and so on simply think it’s a shame when it happens — if they are even aware of it. Unnecessary job loss is being viewed as a private tragedy rather than a sentinel indicator of service and system failure. A lot more sunshine is needed to illuminate this dark corner. Even though OSHA ensures that employers record the number of work-related injuries, lost work-days and deaths, there is no requirement that they record job loss. Why isn’t it being tracked? It will almost always be a much worse consequence than the injury itself. Job loss, especially in someone who was previously healthy but now has some degree of impairment, can be DEVASTATING. Few people are prepared to deal with this double- barreled challenge. For the unlucky ones, this means losing their footing in the world of work forever. We do not even KNOW how many people lose their jobs as the result of work-related injuries much less personal health conditions — and how many fail to find new jobs. I personally don’t think it matters what the cause of the health condition is. These days, more than a HALF of the people entering the Social Security Disability Insurance program are doing so because of adverse secondary consequences of common health conditions like back pain, joint pain, anxiety, and depression. But notice this: there are literally MILLIONS of people who keep working DESPITE back pain, joint pain, anxiety and depression. These conditions should NOT be forcing people into a bleak future of on-going worklessness, especially because unemployment and poverty will WORSEN their health and well-being — and that of their families. Needless job loss can occur because of decisions that doctors and employers make as well as decisions made by workers, their lawyers, and insurance companies. Anyone who COULD have actively supported a worker in staying at work but DIDN’T plays a part in unnecessary job loss. Doctors may thoughtlessly select treatments that worsen instead of improve function, or impose work restrictions that “over-limit” someone who COULD actually perform their job. Employers may refuse to make temporary adjustments that WOULD permit recovery “on the job” — and as a result workers sit home and begin to believe they really are “too disabled to work”. Employers can refuse to engage in a real problem-solving discussion with workers that WOULD have let them come back to work with a very minor modification. Employers can neglect to ask for help from a return-to-work expert who COULD have told them about a $200 piece of equipment or work process alteration that WOULD have made it possible for the worker to keep doing her regular job. Insurers COULD routinely (instead of occasionally) make career counseling and job finding services available to workers who appear headed for job loss or have already been terminated. Etc. Etc. So, who DO you think should be held accountable for job loss in those situations? You and I as taxpayers are going to pay benefits for the rest of these people’s lives if they end up on SSDI because the right things didn’t happen. Less than 1% of SSDI beneficiaries ever come back off the rolls. This entry was posted in Causes of Poor Outcomes, People, Organizations & Websites, Policy Issues, Uncategorized and tagged accountability, acquired disability, Federal, incentive, job loss, outcome measures, reporting on August 7, 2015 by Jennifer Christian.